It is not uncommon for an artist to find inspiration from a single individual. Throughout history, artists have used specific models, occasionally almost obsessively; using their representations to delve into the contours and lines that make up the figure and face of their inspiration, and also using their art to explore and reveal the psychology that lies behind the physical. These singular models are, of course, our muses. Named after the ancient Greek goddesses that reigned over the Arts, it is unsurprising that modern day muses are almost awarded a god-like status in the art that they inspire. From the controversial images of Manet’s muse, Victorine Meurent (shown sans clothing and provocatively confrontational in his famous ‘Olympia’) to the striking pop art imagery of Andy Warhol’s ‘Marilyn Diptych’; artists historically continue to focus on a sole figure, in that elusive quest of capturing their ‘essence’ on canvas. Sometimes, it is a simple quest for beauty; a personal mission to recreate the physically idyllic on canvas, and make it almost transcendental. However, on other occasions (and particularly with modern art) it can be a case of trying to discover ‘truth’ in art; representing the ‘reality’ of the muse, and celebrating all that makes them uniquely themselves. Lucien Freud, I find, does this masterfully. When it comes to muses, I find myself no different than the artists that have followed before me. Often I find that friends and critics alike will ask me the same question. ‘Jeremy Penn, where do you find your inspiration from?’ I find myself replying that often it comes from a particular individual; and a particular moment in time. This is what I try to capture in my work, that sense of the transitory made permanent; one particular gaze, or one momentary expression; and then I try to break it down and deconstruct it, piece by piece, to create new meaning. Diane Von Furstenberg has always been someone that I have found hugely influential, even before I chose to represent her in my work. Like Von Furstenberg, my family were also Holocaust survivors (I often donate work to the ADL, which of course, she is a keen supporter of herself). She is, of course, famed throughout the world for her designs, in particular, her wrap-around dress; but she is more than just a clothes designer. She brings energy and force into her work, and has shown the world what it truly means to be a strong, independent female; tough, uncompromising, confident and empowered. This fascinating background has obviously given Von Furstenberg an inner resolve and a level of emotional strength which lends such expression and character to her features; and it is this that attracted me to her as a muse for my work. As you may already know, I have a particular obsession with eyes and there is something about Von Furstenberg’s eyes that I simply had to paint. Da Vinci may have celebrated the elusive and unknowable sideways glance of his muse in the Mona Lisa, but for me, I wanted to accentuate and highlight the penetrating, open stare of this world-renowned designer; and capture some of her grit and determination. I often find my work is immersed in the ghost of pop art; and this free, vibrant style works perfectly for grasping the essence of Von Furstenberg. She cuts a powerful, no nonsense figure, but there is also a distinct sense of joie de vivre about her; a life and energy that is made more apparent with the vibrancy of the color and energy of the brushstrokes. I am not alone in finding Diane Von Furstenberg the perfect muse for my work, obviously. 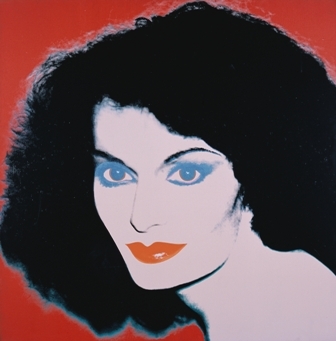 Warhol himself also took delight in representing her, as did Chuck Close and Julian Opie. In fact, she has been muse to several artists, both living and dead. Quite simply, there is something about her that is a siren call to artists; whether its her even, almost classical bone structure, her flowing, untamed hair or those deep, almost interrogatory eyes. For many New York City artists, including myself, she represents the life, potency and challenge of the city; and is the perfect 20th century muse. Perhaps this is what truly modern muses are all about… representing the times that they live within, and personifying the attitudes and atmosphere that surrounds them. The approach to my most recent paintings is similar to developing a logo. You construct something, in this case it was a sketch of Diane, and then I began stripping away the details until I was left with just enough to form Diane's portrait. Like a logo, the more you take away while keeping the image readable, the stronger the image becomes. Diane is an icon both of personal beauty and the beauty she creates.